I was recently sent a set of Sophie La Girafe cosmetics… I didn’t even know they were bringing out a Sophie Cosmetics range and as we are SUCH Sophie lovers I was a little too excited over this! We have used each of the 3 products so I will be reviewing them all separately in a little more detail! 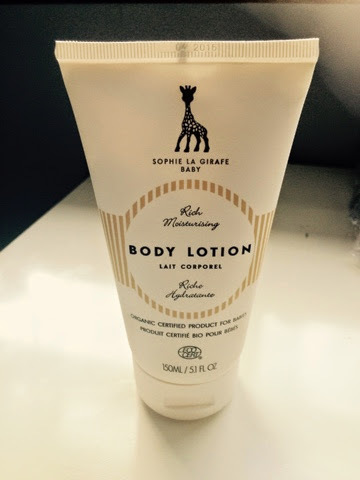 The Sophie La Girafe Baby Body Lotion is very rich and creamy but really absorbs well. I’m not usually one for lathering up little people in lotions & potions but Florrie-Belle has particularly dry skin & I love that it is all totally organic & certified for babies. The cream smells divine, exactly how you imagine a newborn should smell & it has really helped with Florence’s dry skin! I have even been pampering myself & Mini Meldrum with it & will definitely be purchasing this body lotion when it runs out. Check out the Sophie Cosmetics website to see if anywhere local to you stocks the range. Alternatively you can order online from Boots. This gets a big fat ‘Rate It‘ from moi!